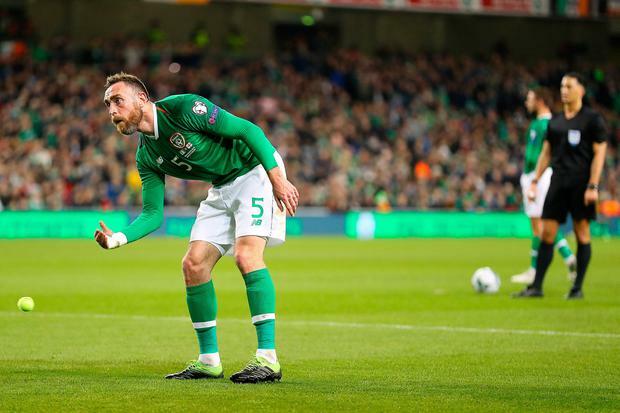 The planned protest from Irish fans about the recent controversy surrounding the FAI went ahead at the Aviva Stadium tonight as a number of fans threw tennis balls onto the pitch during the first half of the Euro 2020 qualifier against Georgia. John Delaney has been under scrutiny this week after stepping down from his role of FAI CEO to become an Executive Vice President, with fans expressing their dissatisfaction by throwing tennis balls onto the pitch in the 33rd minute - a reference to Delaney's infamous request to be the 33rd team at the 2010 World Cup after Thierry Henry's playoff handball. Just after the half-hour mark, and with Ireland awarded a free kick in a promising position, a cohort of supporters threw tennis balls onto the pitch. That protest prompted a short delay, with RTÉ commentator Ronnie Whelan slamming those who took part for halting the game when Ireland were in the ascendancy. "Completely and utterly ridiculous," he said. "It has been a very, very good first half from Ireland and they are rewarded by balls being thrown on the pitch. There were 50, 60 or 70 balls thrown on so that tells you everything. For a half an hour, they have been magnificent - that's the best football we've seen from Ireland for a long time." However, the protest didn't hurt Irish momentum, with Conor Hourihane slamming the subsequent free kick to the net to put Ireland in front. Speaking at half time, RTÉ pundit Richie Sadlier defended the supporters who took part in the protest. "These fans are angry and disillusioned for very legitimate reasons," he said. "They were feeling this way long before Mick McCarthy took the job. They feel if there is no meaningful change in the FAI at executive level, they will continue to feel this way long after Mick leaves. It is a sign of how upset they are, how disgruntled they are, that they would show up here and do that. "It is clear why they would do that. They could go and do that in their back garden tomorrow but there are no cameras."